Political thrillers are not new in Bollywood cinemas and certainly patriotic films have dotted the list of Bollywood films over the years. There is a sense of drama mixed with pride which makes these films popular with audiences. 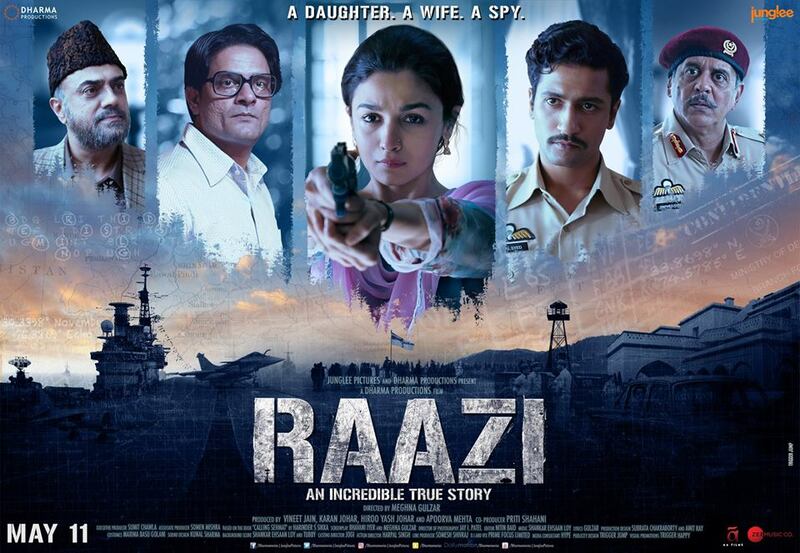 Raazi is the latest in this line released on the 11th of May to worldwide audiences. Headlined by those behind the scenes namely its director Megna Gulzar and producers Dharma productions and Junglee productions who made the movie good even before the release, the film stars Alia Bhatt and Vicky Khausal. Raazi is itself based upon an incredible true story written about in Harinder Sikka’s novel Calling Sehmat. A fascinating story of a Kashmiri woman going undercover to uncover vital plans of the Pakistani military before the 1971 war, Sehmat is both incredibly brave and fighting for her life, but at the same time is human and upmost understanding the need for her to do this for her country. As this is a border story and a true story, not much can be done with the screenplay to get away from the book. However, as is the way with Meghna Gulzar, she brings a personality to every side of the story, whether it be Sehmat the Indian spy and wife of a Pakistani military man, Iqbal the military man with an immense sense of duty to everything including his wife, Shishir Sharma as the Brigadier with the weight of the world on his shoulders or Rajat Kapoor as Sehmat’s father: a man and father who knew what danger he was putting his daughter in and still went ahead anyway. Every character is thought through and has a significant part to play in the story but there is a great variance in the screen time they get. This means that the audience forgets whether certain characters are even alive at any given point in the movie until they suddenly re-appear to deliver a critical moment of dialogue. The film puts Alia in a space she hasn’t been in since her early career in Highway. Alia shows us this by showing nerves of steel when needed to stand up, cowering in nervousness when the fear grips her and crying as events take their turn against her favour. Vicky Khausal on the other side plays Major Iqbal Syed and is both tender as a husband, falling for Alia who he marries under an arranged marriage, but also finding the hard edge of a military man as a Major in the Pakistani military especially when he discovers the lies he has been living with. Both actors play their parts as prescribed, but both seem to fall short in the above mentioned aspects as they both seem to fail to express the depths of their characters. Seemingly they have tried to play to Bollywood stereotypes without properly accounting for the reality in the story. The cinematography has startling moments and a great variety to it too. Starting in the incredible beauty of Kashmir to the streets of Islamabad, from the plain house of Sehmat’s birth to the grandiose residence of the Brigadier, many colours and expectations are obvious to the audience. The camera gives both wide panoramas as well as bringing the cinemagoer right up to the inner depths of both Pakistani and Indian military intelligence giving a full experience. However as it often lingers on the beautiful location shots or gets stuck in a close up shot of Sehmat, we don’t often get a decent look at the whole picture to fully understand her situation. Being a film made between Gulzar and Dharma productions, the last important part of the film is the music. Shankar Ehsaan and Loy are well known and well experienced group of music directors and with Gulzar writing some great lyrics to stir audience hearts both for the patriotic pride as well as the tragedy of Shemat’s story. While there are only 4 songs they are well dispersed throughout the film being used in small bursts where they are at their most powerful. Overall this film hits all the expected points. The story is both intriguing and twisting, while filling audience hearts with the sadness of drama and the pride of patriotism. The music is used effectively to make maximum impact and manages to be both touching and loud. The cinematography highlights the beauty of all scenes within the film. However in comparison with other patriotic human stories like Neerja it lacks the hard hitting edge, a final push to bring the life of the main character squarely into view. Raazi has the talent of some of the best in the industry to become a fullfilling film based on reality yet somehow you walk away feeling something isn’t quite right.